Pumpkin was my very special doll when I was six or so. She had red hair that I’d washed and played with so much it was matted. Her face was plastic, but she had a cloth body and a dress you could take on and off. She was my favorite. I still love dolls and today I thought I’d share the work of several doll makers I’ve discovered recently. I hope you’ll like their work as much as I do, and perhaps buy a special doll from one of them, too. 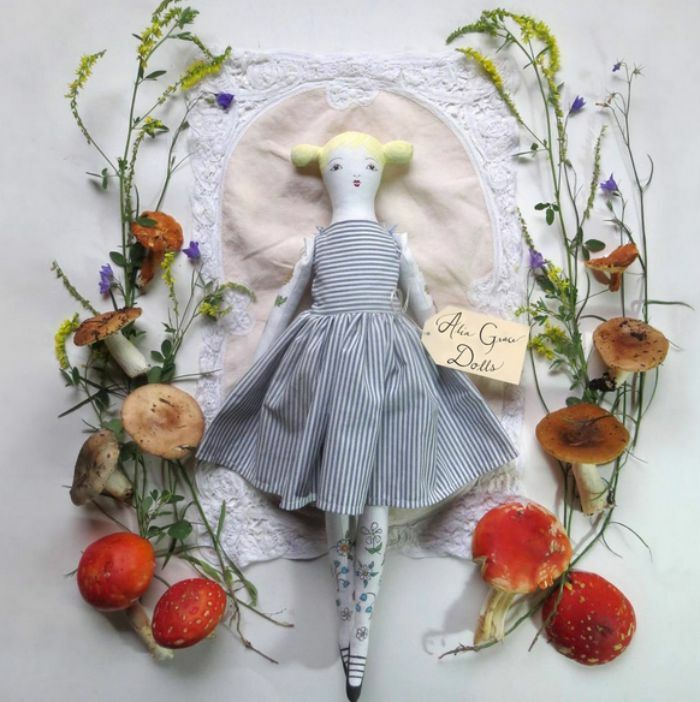 Alia Grace Diaz is a doll maker living in Philadelphia. 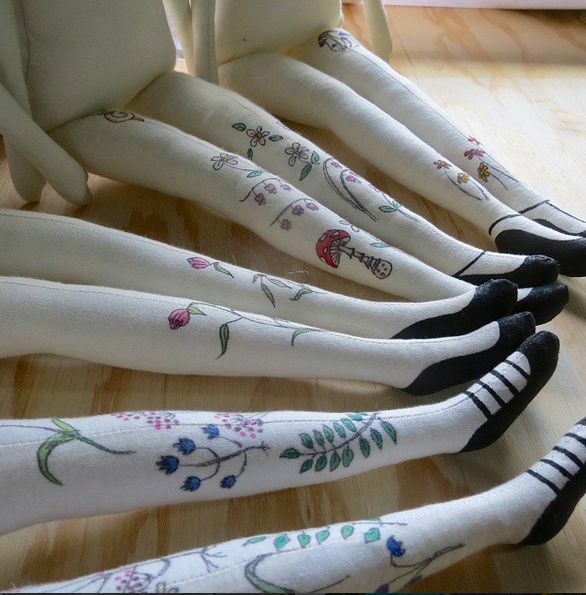 She combines all different media in her work – sewing, knitting, drawing, and beading – and enjoys making fashionable clothing for each of her dolls, too. I love the classic rag doll shape, and the hand-drawn tattoos. This picture with the mushrooms and the vintage hankie frame is amazing. Lovely fox dresses! Check out Alia Grace on Instagram and buy a doll in her shop on Etsy. 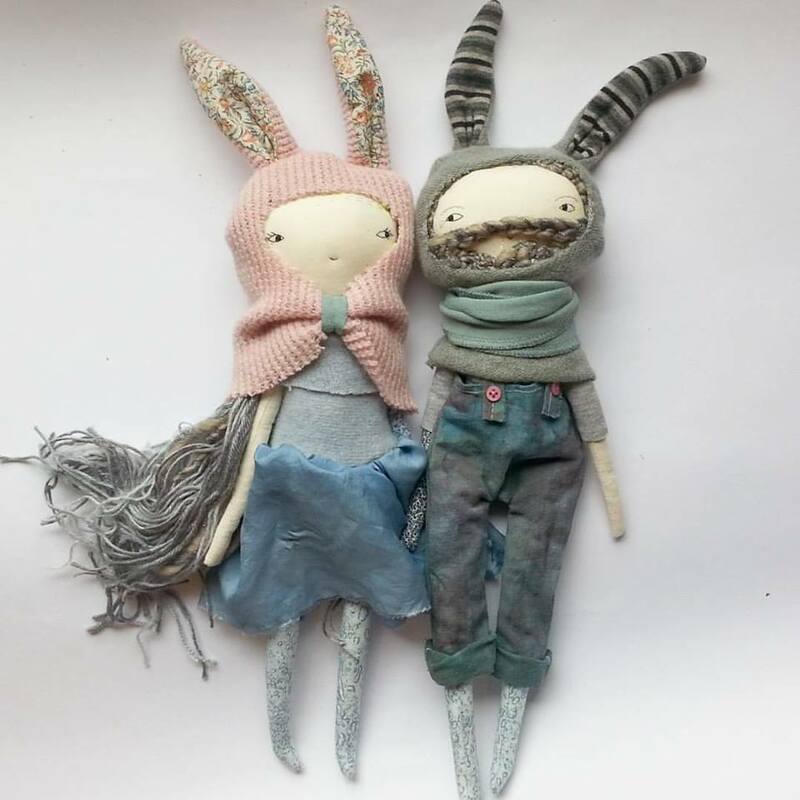 Humble Toys is a handmade doll business by Anwen Sutherland, an Ontario-based artist. Like Alia Grace, Anwen combines all sorts of different media in her dolls (I love how dolls are like little canvases to be decorated). Anwen has a particularly interesting business model. 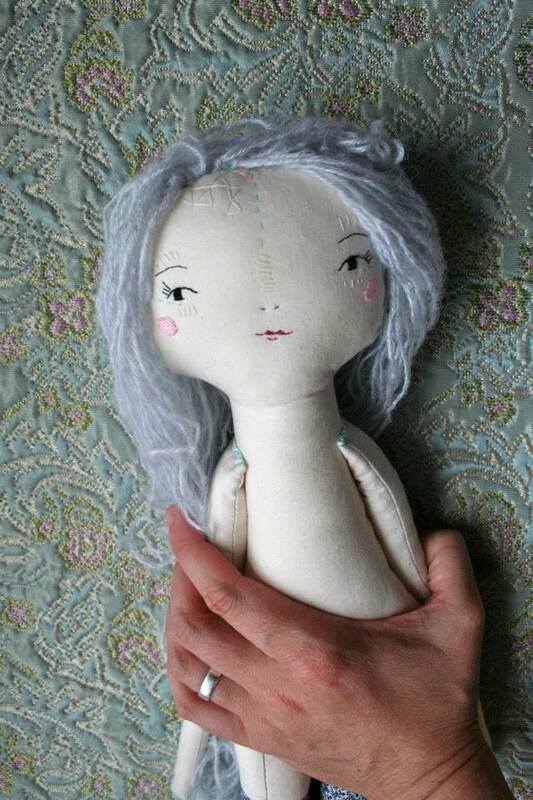 She makes a small batch of custom order dolls each month, posting in-progress pictures on Facebook as she makes them. Customers can select the color of the skin, hair, and general outfit details plus put in special requests like a mermaid tail or hat with cat ears. 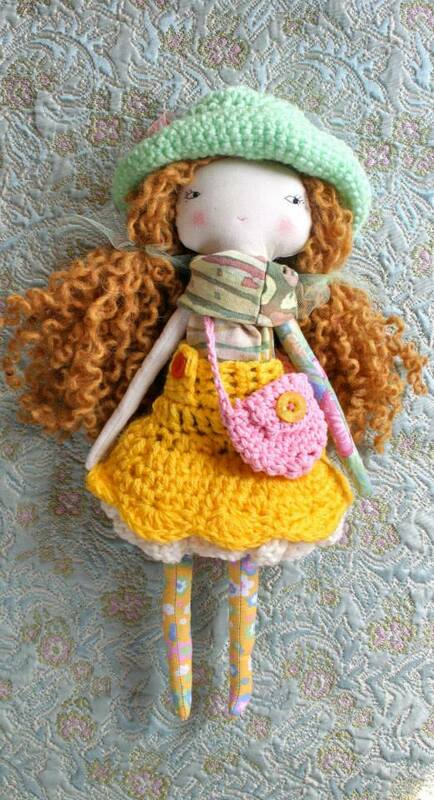 Leticia is an artist and doll maker living in Madrid. 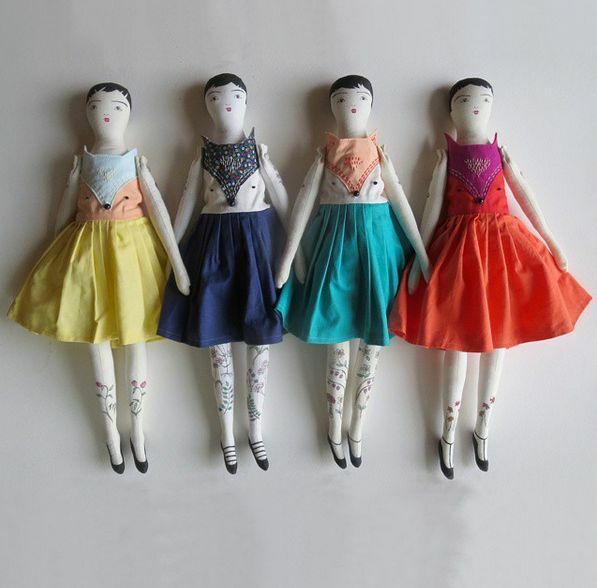 The simple body shapes and embroidered features on her dolls make them a perfect canvas for whimsical embellishment. 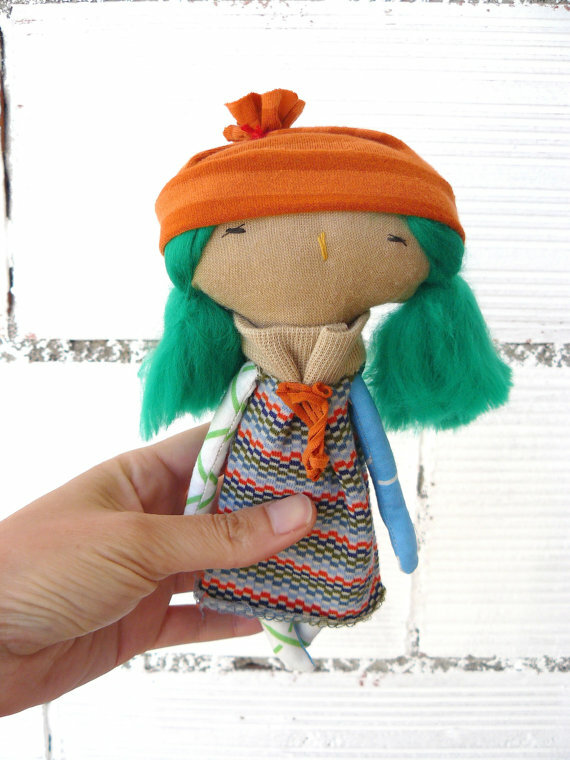 Browse through Leticia’s shop on Etsy and pick up a doll for someone special (or for yourself because you’re special, too, you know!). Dolls are not only a blank canvas for the artist to decorate, they’re also a blank canvas for a child’s imagination. Did you have a special doll as a child? Share a memory of it with me. Thank you Abby for this feature. 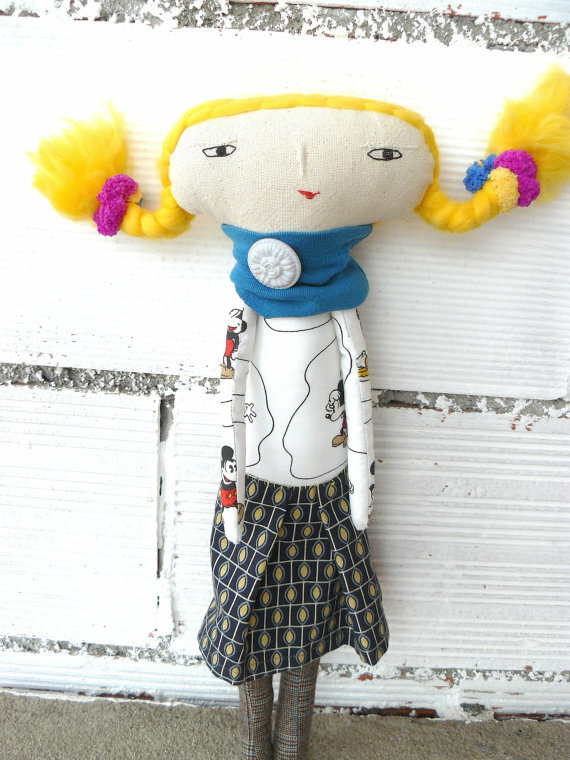 My beloved companion was Chrissie, a cloth doll from Dolls By Pauline. She had beautiful auburn brown braids, and hand painted blue eyes. She was my good friend for years and years. I’ve started making dolls, myself, out of my love for her. I never really liked dolls as a child – I preferred my soft cuddly toy animals by far, who got dressed up, taken out in the pram and tucked into their beds. My daughter was the same. In fact I made a lovely doll when she was small, with sweet layers of pretty clothes, great hair and pretty face but she hardly touched it! I was proud of it, but as a toy it wasn’t a great success and she barely remembers it now. I am much more fascinated by dolls as an adult and want to make them but don’t want to be that strange person with dolls on the bed. I would have to keep them though, as it is far too difficult to pass them as safe for sale here in the UK. Not unless you can prove they are collectors items. If it looks like a toy that it going to appeal to a child, then that is how it is treated by law. There are far too many regulations about toys to consider making and selling them in the UK. Besides, mostly they are simply not going to pass the rigid child proof testing even if I took it on. They would be stylistically compromised. Burning them, and pulling their limbs to see if they fall off is not an area that sounds like fun for me. Besides those arms and legs would fall off when tugged so very hard! I know that handmade toys are basically safe but most simply would not pass these tests in most cases. That doesn’t mean I wouldn’t give my child a felt kitty with embroidered or safety eyes to play with and it is perfectly legal for me to do so, but the same laws don’t apply for actual toys for sale as exists for patterns. My favourite of those dolls is the one wearing the bright yellow skirt with the little pink bag and scarf, she has a pretty face and I love the clothes. 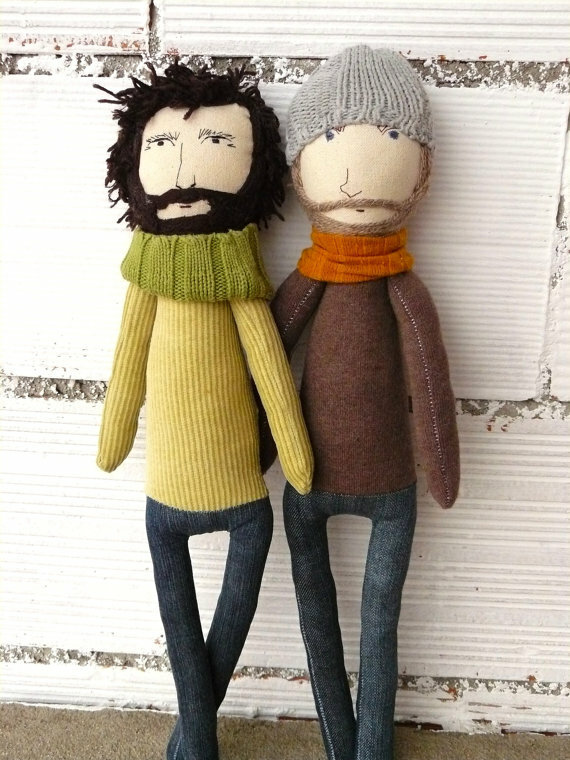 The other ones I like are the bearded one with the green jumper and his companion. I like the characters. I didn’t like boy toys very much as a little girl though and although I learnt to love him lots, I did want the little girl bunny belonging to my sister, rather than the boy rabbit I got instead! I only had hard dolls as a child and sooner or later their eyes were poked in and their hair ruined by washing it. What I did love was the outfits they sometimes came in (always with hats) which were beautifully hand knitted by the giver of the doll. Sometimes my mum crocheted little dresses too and she sewed clothes for them occasionally as well. In fact it is that sewing for dolls that I got involved with as a child that cemented my interest as a sewer.